as part of our Beyond Reality book club reading group on GoodReads. 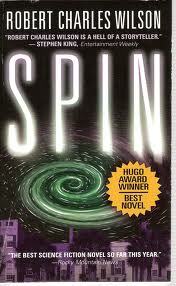 I definitely thought the premise behind Spin was a great SF concept: the Earth gets wrapped in a membrane which cuts it off from the Sun, satellites, and the stars. As time proceeds normally on Earth, outside the membrane time is accelerating at mind boggling speeds. Aliens, or whoever caused the bubble, seem to have propelled the Earth on the fast track to the end of the solar system. As a kid I always shuddered to think of the Sun expanding and consuming the Earth. And then I would feel some relief when the teacher said, this won't happen for billions of years! This book taps into that fear and it propelled me through to the end. Several of the concepts that Wilson has created around this are fascinating, involving time displacement, a Martian colony, nanotechnology, etc. The main narrator is a doctor, Tyler Dupree (swear that name sounds like it came from another novel), who is not a genius but is the best friend of the mercurial genius who helps solve the mystery of the Spin membrane, Jason Lawton. Jason has a twin sister, Diane, who Tyler loves but can't have because he's poor and they are rich. This part of the novel is a good classic structure: an outsider who observes great epic things happening and can tell us all about them in the novel. The Spin event occurs when they are kids and their whole lives are defined by it. Jason becomes the head of an agency that works with Nasa to analyze the Spin membrane and what is happening outside the Earth. Diane becomes involved in a religious cult that sees the apocalypse coming down the horizon. Tyler becomes a doctor and takes a job as Jason's personal physician. The main problem I had with this book, which prevented me from giving it 4 or 5 stars, were these 3 characters. They didn't seem that vibrant to me. Tyler spends decades pining away for Diane, resisting all but one other relationship. Diane seems like an idiot, involved in a stupid cult that almost kills her. Jason is the least well developed, he's just there to be the genius who figures it all out, with no relationships of his own other than the one with his father. I am still glad I read the book. With cool SF concepts and a sprawling plot that spans decades, I can see why this novel won the Hugo award. Three out of five stars. For more discussion on Spin, check out The Incomparable podcast episode 11 (To Be Continued). They made an interesting comment about how many of the SF concepts in Spin had been previously used in other works. Nuff Said.